In Southeast Asia, the growing gaming popularity is fueling Asia’s 44% contribution to the total global population of esports enthusiasts. According to Esports Media Hub, Thailand has over three million active esports participants, representing almost 5% of the country’s population. Therefore, it’s a perfect market for Studio INVATE, where gaming is a passion for nearly the whole staff. “We play all genres of games and each of us has several years of experience in the game industry in Thailand and Southeast Asia,” notes Pachara Ruangrasameejantorn (Benz), the company’s co-founder. This doesn’t go unnoticed by the tournament producers of big-name gaming events. In recent months INVATE has produced Blizzard’s Hearthstone Major tournament in July at Pattaya Beach; the six-day GPL Summer, a professional League of Legends league tournament; and Garena RoV Major League, a Republic of Varrock tourney with a $150,000 prize pool. Overall, the studio produces live stream broadcasts for 15 major esports tournaments every year, each with up to 40 gamers competing and up to 50,000 spectators viewing the live stream. The rest of the company’s weekends are filled too, with an additional 30 medium-sized and smaller esports events. Studio INVATE has grown to become the largest production company specializing in esports in Thailand and they still have big growth plans. INVATE have the desire to expand but face the limitations of SDI-only production in a computer-based world. As a result, Benz and his team knew they had to go with IP video production. The team already use NewTek TriCaster 8000 integrated production system along with the NewTek 3Play 4800 replay solution for their live production services, but the requirements in esports production were changing quickly. In other words, it’s not a field or court group sport where a separate camera isn’t required for each individual player at all times. In esports competitions, since anything can happen at any time, each player has coverage. “You need more camera angles involved in the production” says Lim, who worked with Studio INVATE on installation and training. Looking at the size of the typical tournament events INVATE produces, they calculated that they would need to switch among at least 24 hybrid IP/SDI feeds. For instance, “Twelve come from SDI sources such as the players’ POV cameras, the announcers’ fixed cameras, and the roaming action cameras. 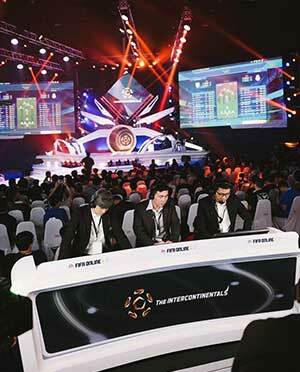 The rest are from computer sources, like the gaming screens of the players plus graphics and effects, which we make high-end, similar to live sports,” says Studio INVATE’s Benz. In order to hit that 20+ input requirement, with most sources coming in over IP, Benz and his team selected a NewTek IP Series including a Video Mix Engine VMC1 (which can switch up to 44 external inputs, from both SDI and IP sources) and a 4-stripe Control Panel. In the first instance, INVATE expanded the VMC1 unit’s built-in SDI capacity with a NewTek NC1 SDI input units to achieve a total of 12 SDI inputs. They then added a NewTek TimeWarp replay controller, so they could have an operator performing live replays during the tournaments and in post-game. And once the complete system was installed, they customized the NewTek IP Series to maximize its advanced, built-in capabilities, and augmented it with the super abilities they needed for maximum creativity. In addition, NewTek’s standard Tally over NDI can support up to 44 cameras and with the SDK INVATE can modify specific functionalities for their own use to integrate with the features of their existing Blackmagic cameras. However, when the company takes its show on the road to major events, some esports venues don’t have a high-speed network. It’s common for Studio INVATE to work with around 1Gb networks at large events. That’s when NDI’s efficient encoding and performance keeps the video moving, sending multiple ultra-low latency video streams simultaneously. Creativity is critical to Studio INVATE and they extend every visual capability of the IP Series to its creative limits. Mix/Effects are one example. This is a palette of layerable visuals on which multiple switcher sources can be individually positioned, arranged and treated with special effects, resulting in its own composition or as its own unique source. IP Series has eight of them, each supporting four sources plus four key layers and Studio INVATE uses all eight. INVATE heighten the visuals further with their customized implementation of the NDI SDK, using the CasparCG application to drive graphics, animations and titles. Each tournament requires its own unique look, meaning no two productions are the same. Studio INVATE has mastered production problem-solving in live esports coverage through creativity and inventiveness, allowing it to stand apart in the expanding esports market in Southeast Asia.